This is a short article about ticks and Lyme Disease, but the real reason I am passing it on is that it illustrates how "common sense" can be incorrect -- they reasoned logically from the facts that Lyme Disease would go up when they removed the lizards, but the opposite happened, against common sense. There are other factors, obviously, that they hadn't known. Western fence lizards (Sceloporus occidentalis) are found with dozens of ticks attached. Areas in California where Western fence lizards were removed had a subsequent drop in numbers of the ticks that transmit Lyme disease, scientists have discovered. "Our expectation was that removing the lizards would increase the risk of Lyme disease, so we were surprised by this finding," said ecologist Andrea Swei, who conducted the study while she was a Ph.D. student in integrative biology at University of California, Berkeley. "We found that the result of lizard removal was a decrease in infected ticks, and therefore decreased Lyme disease risk to humans." Results of the study, published online today in the journal Proceedings of The Royal Society B, illustrate the complex role the Western fence lizard (Sceloporus occidentalis) plays in the abundance of disease-spreading ticks. 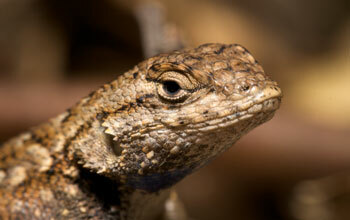 "This study demonstrates the complexity of infectious disease systems, and how the removal of one player--lizards--can affect disease risk," said Sam Scheiner, program director at the National Science Foundation (NSF), which funded the research through a joint Ecology of Infectious Diseases (EID) Program with the National Institutes of Health. At NSF, the EID Program is supported by the Directorates for Biological Sciences and Geosciences. Lyme disease--characterized by fever, headache, fatigue and a bulls'-eye rash--is spread through the bite of ticks infected with bacteria called Borrelia burgdorferi. In the Western region of the U.S., the Western black legged tick, or Ixodes pacificus, is the primary vector for Lyme disease bacteria. Up to 90 percent of the juvenile ticks in this species feed on the blood of the Western fence lizard, common in California and nearby states. A previous study by UC-Berkeley entomologist Robert Lane found that a protein in the Western fence lizard's blood killed Borrelia bacteria, and as a result, Lyme-infected ticks that feed on the lizard's blood are cleansed of the disease-causing pathogen. The lizard is thus often credited for the relatively low incidence of Lyme disease in the western United States. The new study put that assumption to the test experimentally. "When you have an animal like the Western fence lizard that supports a huge population of ticks, you can't assume that all the juvenile ticks will go to another host if the lizard population drops," said Lane, a co-author of the paper. For their field test, the researchers selected 14 plots, each measuring 10,000 square meters and spread out over two sites in Marin County, Calif.
From March through April 2008, before tick season went into full swing, the researchers captured and removed 447 lizards from six plots--three at each site--and left the remaining plots unaltered as controls. The lizards that had been captured were marked before being relocated so the researchers could determine whether any wandered back into their old haunts. After the lizards were removed, the biologists spent the following month trapping other mammals known to harbor ticks--particularly woodrats and deer mice--to determine whether they had an increase in ticks as a result of the lizards' absence. The scientists also checked for differences between control and experimental plots in the abundance of ticks. In plots where the lizards had been removed, ticks turned to the female woodrat as their next favorite host for a blood meal. On average, each female woodrat got an extra five ticks when the lizards disappeared. However, the researchers found that 95 percent of the ticks that no longer had lizard blood to feast on failed to latch onto another host. "One of our goals was to tease apart the role these lizards play in Lyme disease ecology," said Swei, now a post-doctoral associate at the Cary Institute of Ecosystem Studies in Millbrook, N.Y.
"It was assumed that these lizards played an important role in reducing Lyme disease risk," she said. The tale, it turns out, is even more complicated than that. Other co-authors of the paper are biologists Cheryl Briggs of University of California, Santa Barbara and Richard Ostfeld at the Cary Institute of Ecosystem Studies in Millbrook, N.Y.